Yes, Jesus was the King of Kings and the Lord of Lords. Our Blessed Mother knew this truth deep in her heart. Therefore, as she watched Pilate bring her beaten and bruised Son out for all to see, and then proclaim Him as King, she would have heard and believed. Pilate spoke these words in mockery and sarcasm, but our Blessed Mother knew them to be true. What a contrast was thus presented for all to see. 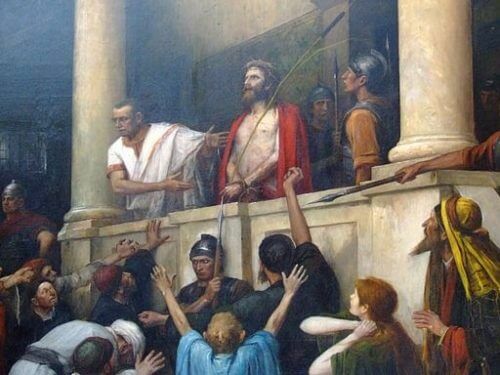 On one side there was Pilate, the worldly governor who had authority to crucify Jesus or release Him. On the other side was Jesus, bound hand and foot, treated as a criminal and seated on the judgment seat. He was about to be condemned to death by an earthly ruler. But from a divine perspective, Jesus was about to be enthroned on the true Judgment Seat of Grace. He wore a crown of thorns, but from the perspective of Heaven it was a crown of glory. He was about to receive the sentence of death, but from the perspective of Heaven it was a sentence that set all sinners free. As our Blessed Mother stood before the Cross of her Son, she would have pondered these words of Pilate over and over: “Behold, your king!” Mother Mary did this perfectly. She beheld Him with her eyes and adored Him with her heart. She acknowledged His kingship and pledged her total submission to His rule. He was not only her Son, He was also her King in every way. The grace and mercy flowing from His throne of the Cross directed every moment of her life. Too often in life, we fall into the error of valuing earthly power more than Heavenly power. But the kingship of Jesus should teach us that earthly power pales in comparison to the Heavenly authority Jesus exercised. He allowed men to treat Him as a criminal. But He exercised an authority that far surpassed the temporal influence of these earthly “kings.” Jesus’ Kingdom was not of this world. It was in the order of grace and mercy. Our Blessed Mother knew and pondered this, and chose her Son as her eternal King. “Behold, my Son, my King!” she would have prayed. Reflect, today, upon which kingdom you participate in more fully. The kingdoms of this world need to be transformed by the one and only Kingdom of God. We must live in this world but not be a part of it. We must allow the dictates of the King of Grace and Mercy to rule our lives and we must not allow ourselves to become intoxicated with the temporal “power” that this world offers. Choose Jesus as your King as you stand beside His loving mother. My dearest Mother, you understood well that the disingenuous words spoken by Pilate contained a much deeper truth than he understood. Your Son was King indeed. He was the King of Heaven and one day His Kingdom would transform even the visible world when every knee would bow before Him. My dear Mother, pray for me that I may always keep my eyes upon the true Kingdom of Heaven and that I may never be drawn into the corruption of earthly power. Pray for me that I may be an instrument of the dictates of love pouring forth from the throne of your divine Son. My dear Lord and King, I behold You and acknowledge You as the ruler of my life. May every breath I take, every word I speak and every action I perform be done at Your gentle command. I choose You, this day, as the sole and complete ruler of my life. Mother Mary, pray for me. Jesus, I trust in You.